Drivers at the intersection of Sutton and Front Streets, in downtown Maysville, are advised to obey the stop sign. Although the countryside in front of them may look inviting, it is actually the work of Louisiana artist Robert Dafford. 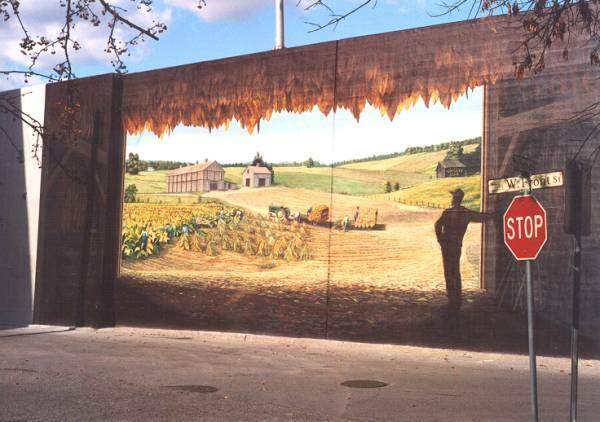 Using the city's floodwall as his canvas, he created this mural depicting field workers harvesting tobacco. Other floodwall murals provide a glimpse back into Maysville's history, and include early riverfront scenes, the Underground Railroad, and native Americans hunting bison. More information about the murals can be found on the City of Maysville's web site.